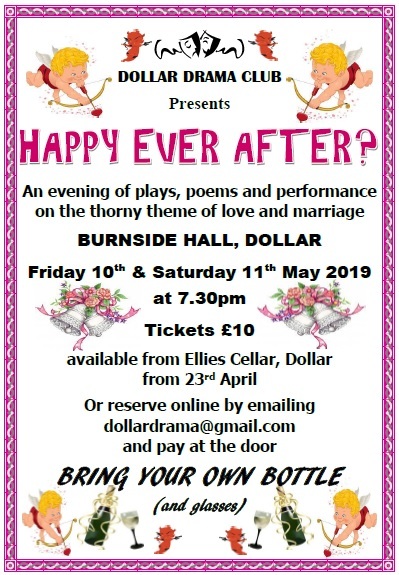 Dollar Drama Club's next production will be an evening of plays, poems and performance on the thorny theme of love and marriage, titled "Happily Ever After". It will be performed on Friday 10th and Saturday 11th May in the Burnside Hall, Dollar. This is a BYOB event (bring your own bottle, plus glasses!). Ticket prices are £10 for adults and £7 for under 16s. Tickets can be reserved by emailing dollardrama@gmail.com saying how many tickets and for which night. Payment is at the door on the night. Please let us know if you need to cancel reserved tickets (there is no charge for this). Alternatively, tickets will be available to buy in Ellie’s Cellar (Bridge Street, Dollar) from 23rd April onward. It promises to be an excellent evening's entertainment. 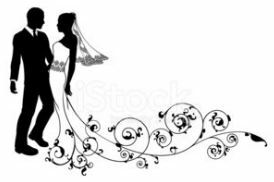 Love and marriage..... what could possibly go wrong?